The series has shifted back to The Oracle as the Golden State Warriors look to build on their record-setting performance in a Game 2 win over the Nuggets. The Warriors torched the Nuggets for 131 points in a 131-117 win on Tuesday night, setting the stage for what figures to be a frenzied home crowd in Oakland on Friday night. It wasn't only the 30-point and 13 assist peformance by Curry that grabbed everyone's attention, but it was the sharp-shooting of youngsters Klay Thompson (21 points) and rookie Harrison Barnes (26 points) that basketball fans stunned. It was the highest shooting percentage a team has shot in the playoffs (64%) since the 1991 Utah Jazz. To build on their performance the Warriors will need to know that Denver will come out way more aggressive in Game 3 than they were in Game 2. The venerable head coach George Karl will make sure of that. Its unconscienable to think that the under-sized Warriors were able to out-rebound the bigger and more physical Nuggets 36-26. The Nuggets will make that adjustment. But, what Denver must figure out is how to defend the variety of options the Warriors throw at you. Fearing the perimeter shooting of Curry, Thompson and Barnes, the Nuggets were cheating on the wings defensively, in turn it opened up the lane allowing point guard Jarret Jack to penetrate to the rim and score or penetrate and dish once the expected collapse and rotation took place. Denver looked lost in defending both the other night. The Warriors can win this series if Denver continues to struggle and close out on shooters. The health of Kenneth Faried is also pivotoal to the Denver chances in this series. Faried is the energizer for this Nugget team. He gives them juice and energy. He has been nursing a turned ankle and saw his first action the other night and certainly looked rusty. Denver NEEDS to "Manimal" to turn into the beast on the basketball court he has shown to be. His influence and presence not only helps his team, but it serves as spark for the Nuggets that they are able to use. Game 3 will be a madhouse at Oracle. If the 2007 "We Believe" playoff run by the Warriors showed us anything, its that Warriors fans don't hold back when their team gives them hope. 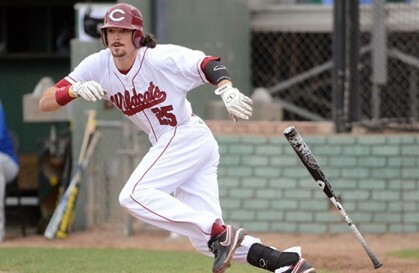 The Chico State Baseball team (32-8) is the second ranked team in the first West Region Baseball Poll by NCAA members. The ranking determines the top six teams in the region that will compete at the NCAA West Regional on the third weekend of May. Many observers thought the Chico State Wildcats would garner the top spot in the region, but that distinction goes to the Cal State Monterey Bay Otters who check in at 30-12, but have a gaudy 18-5 record against teams with records above .500. Chico State is a rather pedestrian 12-8, but can improve on that number this weekend with four games against the 3rd-ranked team in the region Sonoma State. 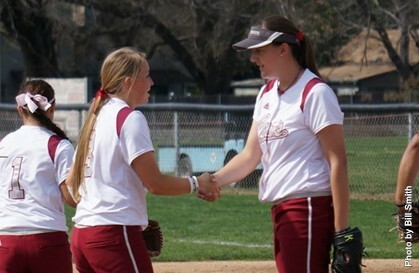 The Chico State Softball team was floundering two weeks ago. Now, they are surging after a four-game road sweep of Sonoma State last weekend in Rohnert Park. The Wildcats have a magic number of 2 as they get ready to host UC San Diego this Friday and Saturday at the Chico State Softball Complex. Two-and-a-half weeks ago the Wildcats lost 6-of-7 in the Mizuno mid-season Tournament of Champions in Turlock. It was a disastrous trip against teams they will be competing against for spots in the West Regional. But, the Wildcats have been determined since and now sit in third place, one game behind the Tritons who visit them for double-dips this weekend. The match-ups are at 11am on both Friday and Saturday. With a pair of wins on Friday the Wildcats clinch a berth into the CCAA Softball Tournament. (AP) — The NBA committee deciding whether the Sacramento Kings should be sold and relocated to Seattle will hold a meeting via conference call Monday. An NBA spokesman confirmed Thursday that the committee, consisting of 12 league owners, will convene on a call instead of in person. Whenever the committee issues a recommendation, NBA owners will have at least seven business days to review the report before a vote can take place. (AP) — Pinch hitter Will Nieves delivered a sacrifice fly in the 10th inning to lift the Arizona Diamondbacks to a 3-2 victory over the San Francisco Giants on Wednesday. Gerardo Parra and A.J. Pollock also drove in a run for the Diamondbacks, who beat the Giants in 11 innings on Tuesday night. Didi Gregorius had two hits. Arizona led 2-1 before Brandon Crawford hit a tying homer off David Hernandez (1-0) with one out in the ninth. Crawford also doubled home a run in the seventh and finished with three hits. Matt Reynolds got three outs for his second save in as many days. Reynolds has yet to allow a run in 11 1-3 innings. Chad Gaudin (0-1) took the loss. (AP) — Stephen Drew hit a two-run triple, David Ortiz had two hits and drove in a run and the Boston Red Sox beat the Oakland Athletics 6-5 on Wednesday afternoon to take a three-game series. (AP) — Mike Smith stopped 33 shots, and the Phoenix Coyotes prevented San Jose from moving up in the Western Conference standings with a 2-1 win over the Sharks on Wednesday night. San Jose had a chance to pass Los Angeles for fourth in the West, but the Coyotes played more like the team still in the playoff hunt. Phoenix beat Thomas Greiss for two goals in the first period and played the tight-checking style that had been so successful the previous three seasons. That left the Sharks tied with the Kings at 57 points. Michael Stone and Keith Yandle both scored, and Shane Doan had a pair of assists for Phoenix. Brent Burns scored and Greiss stopped 30 shots in his first start since March 6 for the Sharks, who will close the season against the defending Stanley Cup champion Kings in Los Angeles on Saturday. It’s nearly impossible to beat four aces, which explains why the third-ranked Chico State baseball team has yet to lose a series in 2013. Kagen Hopkins, last year’s undisputed ace but playing the role of fourth starter this season, threw seven shutout innings as the Wildcats salvaged a series split against UC San Diego with a 3-1 victory Sunday at Nettleton Stadium. Hopkins has now compiled 20 consecutive scoreless innings (Or Eggo’s if you like, since his twitter handle is KegoMyEggo) while improving to 7-0 and lowering his ERA to 1.97. His career winning percentage of .789 (15-4) is the fifth highest in school history among pitchers with at least 18 decision. Hopkins, Nick Baker, Troy Neiman, and Mike Botelho – the team’s current starting rotation – is a combined 25-6 with a 1.79 ERA. The fearsome foursome has held opposing hitters to a .212 batting average and boasts a combined WHIP of 0.97. So no, Head Coach Dave Taylor hasn’t been working out. He just has four aces up his sleeves. All of that has helped the Wildcats win seven series (five via sweep) and split the other three. Third-ranked Chico State improved to 32-8 overall and 25-7 in the California Collegiate Athletic Association (CCAA) and is now one win or one Cal State East Bay loss away from clinching its 17th postseason berth in the past 18 seasons. The top four teams in the final conference standings advance to the CCAA Championship Tournament, which the Wildcats have participated in 13 times in their 14 years in the conference. The team’s 32 wins are the program’s most through 40 games since winning 32 in 2007 and tied for the fourth most ever. The 2002 team started 35-5, the 2000 squad started 34-6 and the 1997 team started 33-7. Chico State got all the offense it would need in the first inning. Eric Angerer led off with a walk, and after Cody Webber reached on a wild pitch after striking out, Blake Gibbs drove in the game’s first run with a single to center. Austin Prott then peeled a single through the right side for a 2-0 lead. The Wildcats finally added to their lead in the eighth on Jon Peters’ pinch-hit double that made it 3-0. Morgan Yee pitched the final two frames to earn his first save as a Wildcat. He allowed a hard-luck run in the ninth after Gibbs and Ryne Clark miscommunicated on a catchable ball in right-center leading off the ninth. Yee got a grounder to short to end the ninth, and when Eric Angerer squeezed the final out at first, the defending CCAA-Champion Wildcats’ conference lead over Cal State L.A. was officially two games with eight to play. Chico State will play a four-game series against Sonoma State next weekend and then wrap up the regular season at home against Cal State L.A. May 3-5. UC San Diego, the team the Wildcats tied with for last year’s conference title, was officially limited from championship contention. The Tritons, now 22-20 overall and 16-16 in the CCAA, are three games behind Sonoma State for the all-important fourth spot. ROHNERT PARK – The Chico State softball team has been burned several times this season when opponents staged rallies late in the game to deny the Wildcats a victory – but Saturday in Rohnert Park, it was the Wildcats’ turn to apply some late-inning heartbreak. The ’Cats posted a pair of dramatic wins over No. 16 Sonoma State, scoring a run in the eighth inning to nip the Seawolves 2-1 in the opener of the twinbill, then in the nightcap plating three runs in the sixth inning to pull out a 3-2 win and complete the doubleheader and series sweep. Saturday’s wins not only improves Chico State’s season record to 23-21, but moves the Wildcats into third place in the California Collegiate Athletic Association (CCAA) standings with a 20-12 conference mark. With the doubleheader loss, Sonoma State slips to 32-16 overall and into fourth place in the CCAA with a 19-13 conference record. With Cal State Dominguez Hills completing a four-game weekend sweep of Cal State Monterey Bay – effectively knocking the Otters out of postseason contention – Chico State’s magic number for securing one of the four CCAA Championship Tournament berths is now two. Any combination of Wildcat wins and Toros losses totaling two next weekend, and Chico State will be playing in Stockton May 3-5 with a chance to win the conference tourney and earn an automatic bid to the NCAA Championship Tournament. Desiree’ Gonzalez, who sat out Friday’s doubleheader, had two hits and three runs batted in Saturday to lead the Wildcats and extend her current hitting streak to 12 straight. Kelli Keefe chimed in with three hits on the afternoon, with Alex Molina and Amanda Cordeiro contributing a pair of safeties for the victorious ’Cats. Sonoma State opened the scoring in game one of Saturday’s double dip, as Ali Palermo led off the bottom of the second inning with a double and came home on a base hit by Hayley Condon. Chico State answered in the top of the third when Keefe singled and scored on a two-out double by Gonzalez. Pitchers Kayla McConnell of the Wildcats and the Seawolves’ Samantha Lipperd matched each other zero for zero for the next four frames, forcing the contest into extra innings. In the top of the eighth, Chico State would take the lead when Gonzalez reached on an error, advanced to second on a pinch-hit single by Molina, and scored on Cordeiro’s double to left field. Sonoma State made it interesting in the bottom of the eighth, getting the potential tying and winning run on base with two outs, but McConnell struck out Holli Brown to end it, giving the Wildcats the 2-1 victory. McConnell improved to 7-10 on the season with the complete game win, allowing just six hits while striking out four. Keefe and Cordeiro each delivered two hits to pace the ’Cats’ six-hit attack. Molina and Sonoma State’s Amanda Llerena hooked up in an impressive pitcher’s duel early in the nightcap – Llerna, in fact, allowed just one Chico State hit – a third inning double by Taylor Hanamaikai – through the first five frames. The Seawolves used the long ball to jump on top in the bottom of the fourth – with Vanessa Currie aboard, Palermo launched her 12th home run of the season over the left field fence, giving Sonoma State a 2-0 lead. It stayed that way until the top of the sixth inning, when the Wildcat offense came alive. Singles by Keefe and Alli Cook set the stage for Gonzalez, who laced a two-out double to right-center to plate both runners and tie the score. Molina followed with a single to right to drive in Gonzalez to put Chico State in front 3-2. For one of the very few times this season, there would be no late-inning drama, as Molina retired the last six Sonoma State batters she faced, setting down the Seawolves in order in the bottom of the sixth and bottom of the seventh to secure the Wildcats’ 3-2 win and completing the doubleheader and series sweep – the first time since 2004 that Chico State has swept a season series against Sonoma State. Molina registered her 16th complete game of the year, raising her season record to 13-6. Chico State tallied six hits in the contest – five coming in the decisive sixth inning. The Wildcats conclude the regular season next Friday and Saturday, hosting UC San Diego for a four-game series at University Softball Field. Cal State Dominguez Hills wraps up regulation play next weekend at home versus Cal State Stanislaus. (AP) — Barry Zito (ZEE'-toh) and Chad Gaudin combined on a six-hitter, Buster Posey homered and the San Francisco Giants beat the San Diego Padres 5-0 on Sunday to complete a three-game sweep. Zito (3-1) bounced back from the worst start of big league career to defeat the Padres for the first time in nearly two years. He allowed five hits in seven innings, struck out four, walked one and did not give up run for the third time in four starts. Posey's first home run of the season was just the 11th this year for the power-starved Giants. (AP) — Roberto Hernandez pitched six effective innings Sunday for his first win since he was known as Fausto Carmona, and the Tampa Bay Rays complete a three-game sweep of the Oakland Athletics with an 8-1 victory. Hernandez (1-3) allowed one run, three hits, three walks and had seven strikeouts in his first win since Sept. 20, 2011, while with Cleveland. The 32-year old right-hander was arrested in January 2012 in the Dominican Republic on false identity charges — as Carmona. They were dropped after he completed a work program. Oakland starter Tommy Milone (3-1) had his season-opening three-game winning streak end. The left-hander gave up six runs and eight hits over 6 2-3 innings. (AP) — The Golden State Warriors got a double dose of bad news Sunday. They learned All-Star forward David Lee had torn his right hip flexor, as feared, ending his season. So, they'll have to continue their playoff series against Denver without the NBA's leader in double-doubles. Making that task all the more difficult will be the return of the Nuggets' top rebounder and energizer, Kenneth Faried, from an injured ankle. Faried sat out the opener Saturday, when the Nuggets edged Golden State 97-95 despite getting outrebounded 55-45. (AP) — Ryan Johansen scored the tiebreaking goal with 1:37 remaining to give the Columbus Blue Jackets a big boost in their push for the playoffs with a 4-3 victory over the San Jose Sharks on Sunday night. Mark Letestu scored twice and Vinny Prospal also scored for the Blue Jackets, who moved into a tie for seventh place with Minnesota in the Western Conference with 51 points. Columbus has played one more game than the Wild and two more than the ninth-place Detroit Red Wings, who are three points back in the race for the final playoff spot. Marty Havlat, Andrew Desjardins (day-zhar-DAN') and Joe Pavelski scored for the Sharks, who needed only to take the game to overtime to clinch a ninth-straight playoff berth. Antti Niemi (AN'-tee nee-YEH'-mee) made 18 saves. (AP) — Yuniesky Betancourt hit a grand slam, and Carlos Gomez and Norichika Aoki also homered as the Milwaukee Brewers used an eight-run third inning to beat Barry Zito and the San Francisco Giants 10-8 on Tuesday night. Betancourt's fifth career grand slam highlighted the seven-hit inning that chased Zito. Rickie Weeks doubled home two runs and Jonathan Lucroy added a two-run single as the Brewers sent 12 batters to the plate. Zito faced 11 of them. Zito (2-1) had opened the season with consecutive scoreless seven-inning games. He struck out five and walked two in 2 2-3 innings and his 0.00 ERA ballooned to 4.86 ERA. Brandon Kintzler (2-0) got the win in relief for the Brewers. The Giants had won 16 straight Barry Zito starts dating back to last year, including the post-season. (AP) — Josh Donaldson's eighth-inning triple drove in Josh Reddick for the winning run and Oakland Athletics overcame starter A.J. Griffin's early struggles for a 4-3 victory over the Houston Astros on Tuesday night. Reddick drew a two-out walk off reliever Rhiner Cruz (0-1) and took off for second just before Donaldson's hit down the right field line landed just fair. Houston outfielder Rick Ankiel made a diving attempt but came up short as Reddick raced around the bases. Eric Sogard added a career-high three hits for the A's, who have won all five games against the Astros this season. Carlos Pena homered for Houston, which has lost four straight. Grant Balfour pitched the ninth for his second save in as many chances after Sean Doolittle (1-0) gave up Pena's tying home run. (AP) — Two shy of setting a new NBA standard, the question circulating around the Golden State Warriors locker room is when — not if — Stephen Curry will break Ray Allen's single-season record of 269 3-pointers during Wednesday night's finale at Portland. With the way Curry has shot the ball this season, he's given plenty of reasons to be optimistic. The rejuvenated Warriors point guard, with his twice surgically repaired right ankle no longer an issue, has shown just what he can do in a season of near-perfect health. He is shooting 45.5 percent from beyond the arc and averaging almost 3½ baskets from long range over his 77 games played. 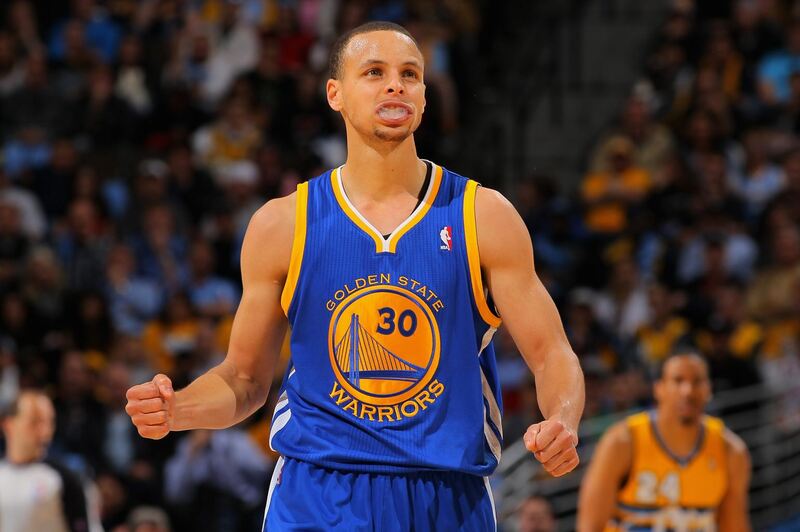 The Golden State Warriors can secure the 6th seed in the Western Conference playoffs with a win tonight. The Warriors can also secure the 6th seed if they lose, but they would need the Los Angeles Lakers to beat Houston at the Staples Center tonight. TURLOCK – With nine freshmen getting a baptism into collegiate golf on the Chico State’s men’s golf team’s 13-man roster, this season has been anything but breezy. Still, the Wildcats have persevered, hanging on to the No. 23 ranking in the nation and No. 6 spot in the West. Tuesday’s final round of the Hanny Stanislaus Invitational at Turlock Golf & Country Club was absolutely breezy. In fact, the windy conditions resulted in high scores and frustrated golfers. But the Wildcats again persevered, shooting a 317 to hang on to fifth place in the tournament. Chico State finished 62-over par. Host Cal State Stanislaus won at 24-over par. Cal State Monterey Bay (+26), Western Washington (+51), Sonoma State (+55) and Chico State followed the Warriors. The Wildcats nipped UC San Diego by a stroke and finished three strokes ahead of Saint Martin’s. True freshman Lee Gearhart was Chico State’s top finisher, tying for 19th place at 14-over. It marked his fifth top-20 finish in the team’s last six tournaments. Freshman Anthony Maccioli recorded the Wildcats’ best round of the day, a 5-over par 77, and finished tied for 22nd at 15-over for the tournament. Freshman Will Flitcroft fired a 78 on Tuesday and finished tied for 30th at 19-over par. Junior Brendan Warner (74-82-82–238) tied for 43rd at 22-over. And freshman Cody Stoffel (80-79-80–239) tied for 45th at 23-over. Playing as an individual, junior Brenden Beeg (80-87-81–248) finished tied for 68th at 32-over. The Wildcats open the postseason portion of their schedule, which they hope will last through the NCAA Championships May 20-24, next week at the California Collegiate Athletic Association (CCAA) Championships in Paso Robles. 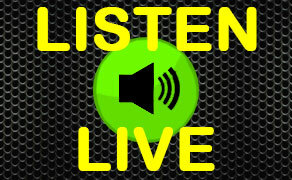 The event gets under way Monday morning. 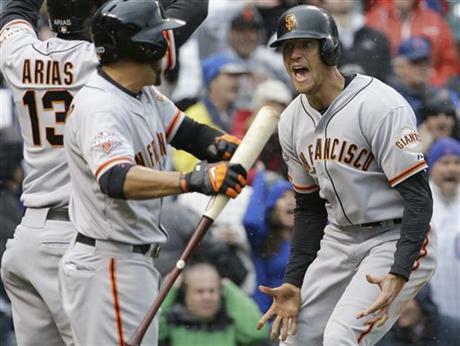 propelled the Giants to a 10-7 victory and series win over the Chicago Cubs. (AP) — Stephen (STEH'-fihn) Curry made seven 3-pointers to finish with 35 points, leading the Golden State Warriors past the severely short-handed San Antonio Spurs 116-106 on Monday night. Curry hit 7 of 13 shots from beyond the arc to move within one of Ray Allen's single-season record of 269 3-pointers set in 2005-06 with Seattle. Curry added eight rebounds and five assists to help the Warriors pull away late and move a game ahead of Houston for the Western Conference's sixth seed. Gary Neal had 25 points and five assists and Patty Mills scored 23 points for the Spurs, who rested their key starters a night after losing 91-86 at the Los Angeles Lakers. San Antonio still had the Warriors on the brink until Curry took control. (AP) — Kevin Durant scored 29 points, Russell Westbrook had 21 before getting ejected in the final 3 minutes and the Oklahoma City Thunder clinched the top seed in the Western Conference playoffs by beating the Sacramento Kings 104-95 on Monday night. Tyreke (ty-REEK') Evans, the Kings' second-leading scorer, did not return after grabbing at his troublesome left knee following a drive to the basket late in the first quarter. Durant hit a 3-pointer and Westbrook set up Serge Ibaka for a two-handed slam during a string of 11 straight Thunder points midway through the third quarter that stretched the lead to 75-51. 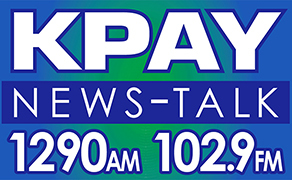 (AP) — Jed Lowrie drove in four runs, Tommy Milone won his third straight start and the Oakland Athletics beat the Houston Astros 11-2 on Monday night. 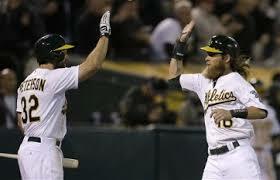 Nate Freiman added a three-run homer and Brandon Moss had three RBIs for the A's. Oakland also benefited from eight walks — four in the first inning by Houston starter Erik Bedard. Carlos Pena had two hits for the Astros, who have lost three straight following a three-game winning streak. Milone (3-0) had a season-high six strikeouts and didn't walk a batter for the eighth time in his career. The left-hander, who won an Oakland rookie record 13 games in 2012, pitched out of jams in the fourth and sixth before leaving following Jose Altuve's one-out RBI single in the seventh.